Students in an introductory environmental science course at Ohio State have written a new, free iBook. It describes some of Earth’s biggest challenges and how people are using cutting-edge science to develop solutions. Called Environmental ScienceBites, the 184-page e-book for Apple devices was written by undergraduate students in Introduction to Environmental Science, a course offered by the School of Environment and Natural Resources. The course’s lead instructor is OARDC’s Brian Lower, an associate professor in the school. An Android version of the e-book is available, too. 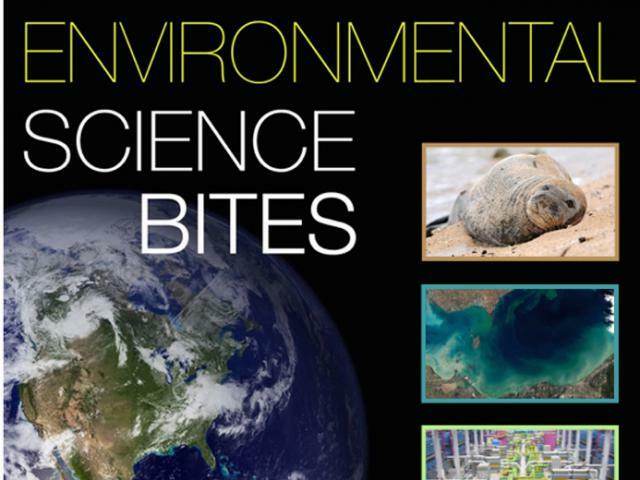 The new book features 25 student-written scientific articles organized into five chapters: Climate Change, Ecosystem Degradation, Energy, Pollution and Population. 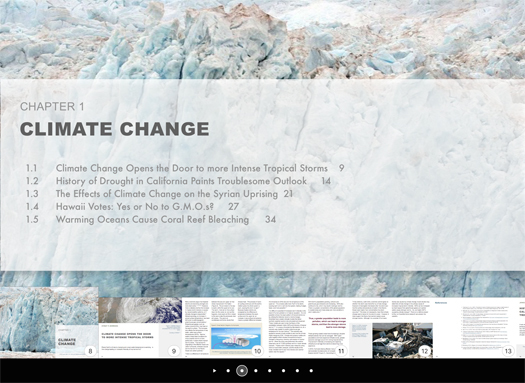 The Climate Change chapter, for example, shown here, has articles on climate change’s role in the California drought, the Syrian uprising and the growing intensity of tropical storms. The new book features 25 student-written scientific articles. Each describes a topic in the environmental sciences. Among the topics, for example, are hydraulic fracturing for gas, desalination of seawater, colony collapse disorder in honey bees and the effects of the tsunami-caused Fukushima nuclear power plant disaster in Japan. The book is available for download with iBooks on Mac or iOS devices at go.osu.edu/BDZZ. It can be accessed via Google Play at go.osu.edu/BDZb and through Ohio State’s Digital Bookstore at go.osu.edu/BDZd.